Gotta catch ‘em all. Again. I know they are not real, but people are wandering around towns all over the world searching for Pokémon. They are using their phones playing Pokémon GO to look for and hopefully catch all the Pokémon. At least in their area. Now if you do not know what Pokémon are, you have probably been living under a rock for the past twenty years or so. Or you have not had contact with anyone under the age of fifty (or older). Or maybe you just do not keep up with the times in any manner. Digital or otherwise. At any rate, if you do not know what Pokémon are, you might not understand why people are wandering around your neighborhood with their phones out, giggling and pointing to each other’s screens. It is funny. We have all seen people walking around with their phones out, but they are usually texting people rather than talking. 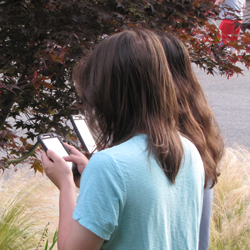 Young people seem to interact with their phones almost exclusively anymore. Whether they are walking and texting or sitting down somewhere, everybody seems to have their electronics out. And often they are communicating to the person right next to them. Not a word can be heard. Just tap, tap, tapping. Tapping on the phone before. But now, the youngsters (I almost said young whippersnappers) seem to actually be talking to one another. They look at their phones as they are walking, but they show each other stuff and smile and laugh and talk. Actually, talk, talk, talking. Talking to the one before. It is almost strange to see them interacting. Instead of zombies walking around attached to their phones, the kids (and young adults) seem to be actively engaged in life. Or at least pseudolife. Or maybe augmented reality life. At any rate, it is nice that young people are talking about more than video games (sorta). They are talking about how much they walked. About where they went. About how sore they are. About what they caught. It is as if they knew how to communicate all along, but they just needed something to talk about. I know. Pokémon are not real creatures. But they are everywhere. You just need a phone to see them. But maybe I should go back in time a bit. I must admit that I am probably the one who got Thing 2 started on video games. After all, I got him a Game Boy for his second birthday. He has had a device in his hands ever since. That first game, was Pokémon. I believe it was the red version. (There were only three versions back then, red, blue, and yellow.) It was a simple video game really. You were Ash Ketchum (or you could put in your own name) and you wandered around the screen looking to catch all the Pokémon. Pokémon were just creatures with strange names like Pikachu, Charizard, and Squirtle. They were cute little things that looked like crosses between two animals or a plant and an animal. Or sometimes, they were just real animals morphed into something that did not look quite so real. Thing 2 got all the Pokémon on his version pretty quickly. He caught and trained Pokémon all day long and beat all the bosses before the summer of his second year was over. He was quite proud of himself and his accomplishments. Okay. Maybe it was me. Maybe I got the Game Boy for my kid so I could play Pokémon. Maybe I caught them all and beat all the gym bosses. Maybe. Well in the sixteen years since I, rather Thing 2, got his Game Boy, we have seen a lot of video games come and go. But somehow Pokémon seem to keep coming back. Different versions with different Pokémon keep showing up on the shelves. And people keep playing them. Now, the new Pokémon GO is quite the hit. And Nintendo has done something that I did not think was possible. The company got kids out of the dungeons they call game rooms or computer rooms and got them outside. True, they are still tied to their devices, but they are walking and talking. They are actually exercising and they do not even know it. Until they wonder what those aches are, and realize they have actual bodies instead of mere avatars. I will probably not join the fun and go find Pokémon around the neighborhood. But you never know. Even if you caught some before, once you start trying to catch Pokémon, you gotta catch ‘em all.